Get Down On Your Knees Or I'll Shoot! For kids, summer vacation is all about wet and wacky backyard fun. 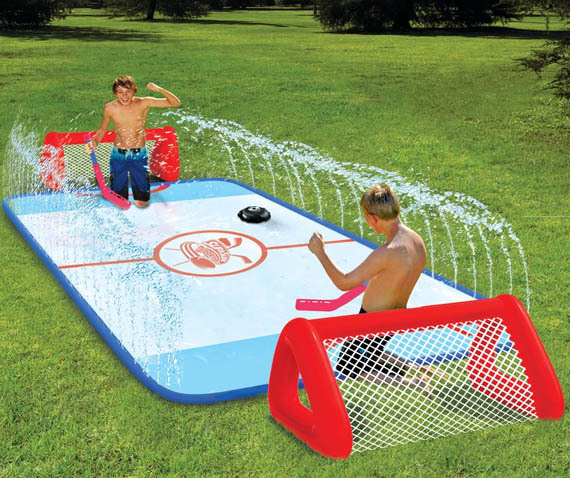 This game lets two players square-off in a sliding, water-soaked game of knee hockey. The Water Soaked Knee Hockey Rink features thirty tiny nozzles built into both sides of the rink, which spray 24″ high fountains of water. Saturating the surface and players, this ensures plenty of slipping, sliding and struggling for control of the oversized plastic puck. Each player is equipped with a soft plastic hockey stick for defending their inflatable goal. A garden hose attached to the rink allows for a continuous water supply.